This story ran in The (Cedar Rapids-Iowa City, IA) Gazette on September 10, 2006. 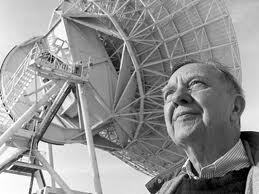 When my Dad, space physicist James Van Allen, died on Aug. 9 he made his exit the way he lived life – quietly, graciously and with his sense of humor in tact. I’m the youngest of his five children – born over a span of 13 years and all experiencing a different part of my Dad’s life, with our own take on who he was. Born Sept 7, 1914, in Mount Pleasant, to a lawyer and his wife, my Dad grew up in that small town, the second of four boys. The family was resourceful and self-reliant. They had a garden and chickens out back. His mother could can vegetables and butcher a chicken. They made their own furniture. They had shelves of reference books. For entertainment, his father would spend hours reading the encyclopedia aloud to the boys. It was a stern household and I’m not sure how all of those brothers each found humor in the small things in life – yet they did. My dad graduated from Iowa Wesleyan and got his PhD from the University of Iowa. He was also schooled by the Dust Bowl, the Depression and the rationing and scrimping of World War II. He was famous for his frugality. That frugality wasn’t limited to turning off lights or brown-bagging lunch. For many years, he drove a ’62 Volkswagen Bug. To deal with the cold Iowa mornings, he rigged a rope with a handle so that he could wrap the rope around the belt drive and start the car – much like you would a lawn mower. AAA was not an option. More famously, on the balloon-launched rockets, known as “rockoons,” in the early 1950s, he filled orange juice containers with hot water to keep rocket fuel from freezing at high altitude. Which proved that not every solution has to be rocket science. Yet, in the every day, being able to put chains on the car tires at 20 below zero was considered a life skill, and my dad seemed to have a wealth of them. He was always very exacting. Every home project was a lesson in patience and humility. We lived on a hill in what was then the outskirts of Iowa City, on what was then a gravel road north of town. In those days, a fact of rural life is that every spring some yahoo will smash your mailbox with a baseball bat. Every spring, my Dad and my brother Tom and I trudged down the hill to the foot of the driveway, with wheelbarrow, post-hole digger and a carpenter’s level. At our house, every project had to be maddeningly plumb and level. For these occasions, my dad had a few well-worn expressions – often understated and always well-timed: “Give it a good tamping down,” he’d say. “That’s it – Bear down on it!” “That’s the old fight!” And, when things didn’t go according to plan, he’d groan and say, “Oh, my aching back.” My brother and I would pull our hair out. But putting up the new mailbox was an exercise in exactitude. This might also help explain how my Dad continued to collect data from Pioneer 10 three decades after its launch. Around the house and in the family cars were small notebooks with an attached string and a tiny pencil, sharpened to a point with a pocketknife. These were the “logs.” When you got gas, you wrote down the date, the gallons, the price, location. When you traveled, you wrote down the mileage, time you left, destination, time of pit stops, arrival, motel check-in, tolls, money spent, and so on. Recently, there was a story in the Philadelphia Inquirer about a professor at Penn who had studied grit and its role in some famous successes. Edison, Einstein, Magellan – all these guys were smart. But they didn’t start out as “geniuses.” They had failures. They had embarrassments. Like all of us, they had the occasional bad day at the office. But they shared one trait. They continued to work at a given problem over years, decades, over lifetimes. Grit is a trait I identify with my Dad. Every day, he left the house at 7:45 a.m. Every day, he was home at 6 p.m. After dinner, he retired to his home study, where he worked some more. He followed this schedule six days a week. On Sundays, he’d often make the family waffles on an ancient waffle iron. But, when the waffle iron was put away, he was off to work, for at least half a day. The work that he did was chipping away, a tenacity demonstrated over years. If there was inspiration, it came after long hours. If there was genius, it was the result of many hours of toil applied toward the same problem. Grit was not something my Dad wore on tattered shirts or work gloves. That was simply his frugality. Rather, grit was something that showed itself in the papers that he published, in the classes that he taught at the University of Iowa and in the doggedness he showed to make sure the mailbox was plumb and level. My Dad worked nearly until the end. This summer, while he was in the University of Iowa Hospital, my oldest sister, Cynthia, brought over two sets of galleys – professional papers that had been accepted for publication but needed final proofing. From his hospital room, working together, they made the final changes. In the hospital, he remained inquisitive and witty. When I flew back to Iowa City to visit him in the hospital in early summer, he sprang to life when telling the story of his lunch last spring with Iowa Hawkeyes head football coach Kirk Ferentz, a meeting arranged by retired track coach Ted Wheeler. My Dad never played football, and only became a fan later in life. But, in two dozen or more games I watched with him, the same questions about the game dogged him. And, apparently, he was never quite satisfied with my lay interpretation of the game. So here was his chance to get some expert information. “Do the quarterbacks call their own plays?” he asked Ferentz. No, he was assured, the plays come in from the sidelines. I can imagine my Dad smiling and nodding with the coach’s answer. I asked if he asked Coach Ferentz another question he’s put to me a dozen times: Why do kickers use of the side of the foot? Surely the ball would go further if they kicked straight on. “No,” he told me, he hadn’t asked. “But why do they kick that way?” Better accuracy, I said. “Of course,” he said, though he didn’t look entirely convinced. When he died, at age 91, obits ran in newspapers around the world. My favorite write-up might have been from the New York Times. The Times is famous for writing its obituaries well in advance. That way, when someone of prominence dies, the story is ready for the next day’s paper. With my Dad’s obit, there was a note that the obituary’s author, a noted science writer at The Times, died in 1996. My Dad knew and respected the writer’s work, but would have been amused to know he outlasted the man who wrote his obituary. Tenacious to the end. Peter Van Allen is a staff writer at the Philadelphia Business Journal and lives with his wife and two children in Bryn Mawr, Pa. This essay was adapted from a speech given at the National Space Club in March, accepting the Goddard Trophy on behalf of James Van Allen. Copyright (c) 2006, Gazette Communications, Inc.